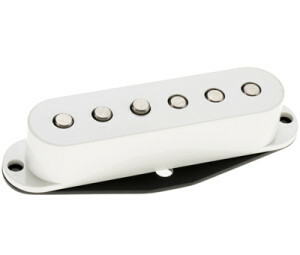 The DiMarzio Injector neck pickup is a great option if you want to keep one foot in a modern vibe, one foot in a classic vibe, and present it in a noiseless wrapper with a nice bow on top. While there are a whole lot of noiseless (i.e., hum-canceling) options out there for single coil pickups, it can be easy to only scratch the surface. Personally, I’ve tried a “rail” version with a vintage tone and I’ve tried a few with the PCB boards with a classic tone and of course I’ve tried the single coils with coils “stacked” to eliminate the hum… which is what we have going on here with the Injector neck. I don’t really dive in to the single coil pool all that much. Sure the water is warm, but I just don’t have that many guitars with a configuration that requires a dedicated single coil tone. But I do have a few with a hum bridge and a single neck and a switching restriction that allows me to only choose one at a time. No special wiring tricks allowed there! lol! So I have to find some single coils that suit my needs for that position. And they have to keep up with a generally high output bridge humbucker. And they have to be hum-canceling. And they have to be able to manage nice clean amp settings while holding their own in a dirty amp setting. Alright, you got me… I do ask for a lot from a single coil pickup! lol! The Injector neck does actually have 4-conductor wiring. While not an option on the type of application I have going on here, I do think that could be cool for the potential for more variety. On mine, the 2 spare wires were already joined together from DiMarzio and cut short. Like way short to the tune of barely a few inches. Good things I didn’t have a need for them! haha! But, I do think there is an option to ask DiMarzio for all the wires to be full length. Knowing is half the battle, right? lol! Everything installed in a breeze and we were off to the races. From clean to dirty amp settings, I have to say the Injector neck has very consistent characteristics. A full low end that is big and punchy while not at all thick or boomy. Smooth mids that tap dance near tubular territory and a high end that is rich, present, and avoids being harsh. There’s a lot of room to allow for adjustments to playing style to get the Injector neck to jump, jive, and wail. Rolling back the guitar volume a bit opens up a slightly more classic voice, making the pickup more versatile. As mentioned, there are a few guitars in the herd with this sort of configuration and similar characteristics. And each one currently has a different variation of a noiseless single coil installed. Going between the different guitars back to back, I have to say that the slightly more modern vibe made playing the Injector neck the best sort of distraction toward playing more so that you can push yourself toward new ideas. One of the best traits I found was that the Injector neck can deliver full-sounding strummed open chords on a clean amp setting and have plenty of drive and push to really let loose with long sustained blues-rock leads on dirty settings.